It’s worth starting with a little bit of background information to describe both methods. Google currently has the larger share of the search advertising market, followed by Bing, the former being 90% of the search market in the UK and 65% in the US. Based on the search phrases you use in Google when looking for something, a range of adverts will be displayed to match those search queries with the aim of driving you to the website of those advertisers. Let’s say an online retailer wants to advertise their range of running shoes for sale. They would choose a selection of search phrases that revolve around the phrases associated with these shoes, such as ‘Mizuno trainers’ or if I know the model, ‘Mizuno Wave Inspire’. Based on this, the search results will be delivered and because they are a product that can be bought online, Google will show the products that have been added to Google Shopping first (which is populated by advertisers via AdWords), followed by a Google AdWords text advert, and then the “natural” (non-paid) results. 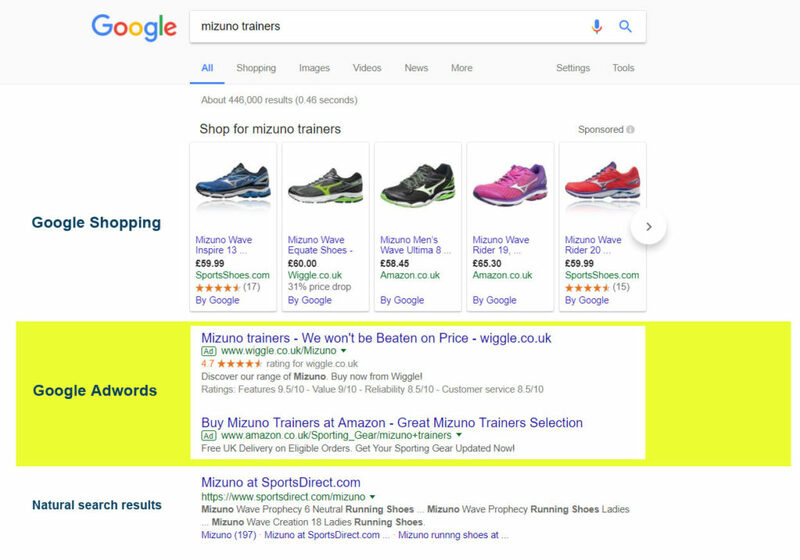 In this case, the Adwords advertiser has targeted quite a general search phrase of ‘Mizuno trainers’ and delivered a broadly-worded advert emphasising they have a wide range of the searched-for items. The advertiser can create differently worded adverts that appear on the Google search results page at the top that specifically target the users’ search phrases and deliver them to their website. The retailer may also choose to ignore location if they ship nationally but obviously the competition of other advertisers will increase significantly, along with the cost of advertising. Gone are the days where retailers or advertisers find themselves with an Adwords account that has run wild and are unwittingly facing a credit card charge of many thousands of pounds. You set a monthly budget in advance of the campaign starting so you know exactly how much you are spending on your Google Adwords. And if you tie in with your Google Analytics account properly you will be able to see exactly how much each enquiry or sale is costing you and from where those enquiries are coming from. Google allows you to target very specific search phrases and keywords along with a location if it’s a locally delivered service or item, very effectively. Have actual locations to visit, such as a cafe or museum. *A local business competing against national retailers for the same items is more difficult – a local businesses will most likely be outbid by the major online retailers, particularly in the white goods, electronics and tech sector, along with travel services, too. This is a well-established sales funnel that works across many sectors and has, by far, the larger market share when it comes to online advertising or ‘paid search’. By that I mean, if you had a product that targeted a very specific demographic, such as a running shoe for middle-aged men, using Google Adwords would not necessarily be the right approach, because you would have to compete with large retailers targeting all buyers of running shoes, and you wouldn’t be able to target your advertising to a specific demograph. Google AdWords’ strength is that it gives you the chence to advertise to people who have an immediate demand for the products and services you sell – as demonstrated by what they are searching for. Typically, Google AdWords (text and shopping adverts) give the best return on investment for sales and enquiries, by targeting people as they are ready to buy. What Google AdWords doesn’t do well, is to generate brand awareness. This is where the competition fills the gap. Facebook advertising is relatively new compared to Google and has been around for about five years. In the same way as all other online advertising platforms, Facebook allows you to create an advert and have that advert appear on its platform (inserted into its users’ timeline) based on a certain number of criteria. Unlike Google Adwords you can specify that your advert is displayed to its users based on a more granular level of criteria. Generally speaking, the cost of advertising on Facebook is cheaper than it is on Google – and it allows you to target the adverts more specifically, which obviously reduces the audience and therefore the capital cost. The very fact that the platform requires users to be logged in and using it before the adverts appear is also a limiting factor and so your adverts are only displayed when they are using Facebook. Facebook advertising has the upper hand when you want to be more picky about who you want to see the advert. If we target a middle-aged man living in London and you want to target your product at him specifically you can choose both his age group, gender and location in the Facebook advertising settings. That means that your advert gets delivered into his timeline and is as targeted as possible. It is also particularly godd for local businesses targeting local people and as long as the advertiser gets involved with the engagement you can be very successful. Facebook can also be used to advertise nationally or even globally at a brand level – being the place to run new product or promotion campaigns. It’s a place to show off stuff but with the ultimate aim to drive users to their website for the actual sale or enquiry. Targeting specific products or services at very defined target audiences, especially if they are lifestyle products or services. However, Facebook’s analytical tools are poor by comparison to Google Analytics. Called insights, Facebook advertising data is very general, albeit you can determine some specifics about the users clicking through on the adverts. 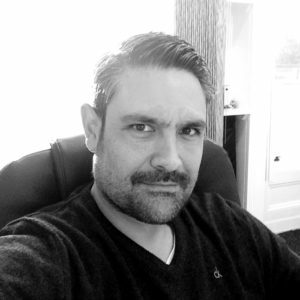 Typically, Facebook doesn’t give the return on investment for sales and enquiries as well as Google AdWords, however it communicates a fuller message than Google AdWords and can generate the awareness and desire for a product, in a way that AdWords cannot. Not suitable for all products or services. The one thing that changes all of this though is the tiny digital file that gets placed on your browser when you search called a cookie. Cookies collect information about your search history. They can be read by other websites you visit and content can be displayed based on the cookies you have in your browser’s history. No doubt you will have experienced it when you’ve been searching Google for something and click through to a few websites – and then lo and behold a few days later on Facebook or other websites that use cookie technology, you start to see adverts for those things you were looking at. Creepy, right? Yes, but all that’s happening is that the website is reading the cookie and finding out where you have been and what you searched for on that website. It will then display appropriate advertising. An example – I was due to have a weekend away. I dug out my old walking boots that hadn’t been used in years. Beyond wearable so I searched for ‘walking boots size 10’ – visited a few websites and bought some. After that, Facebook started to display adverts in my timeline for walking and outdoor clothing companies – beforehand I had never seen these adverts. Facebook had simply looked in my cookies and seen that I had been to the Millets website and looked at walking boots. It then delivered the most appropriate adverts to match that. It’s clever, albeit spooky, and definitely a good way for an advertiser to know their adverts are getting delivered at the right time to the right person. Will it continue in the light of GDPR and the new data privacy rules? We’ll see how that pans out. It depends on what you are selling and who you want to buy it. However, we recommend using a blend of both so that you benefit from visibility to those out there searching for what you sell (Using Google Adwords) and to those that you want to remind you are there (Facebook Advertising).